Hey there! Time for another Mama Elephant's March release highlight! Remember, the new release is live now and available for purchase in the store! Today's set to highlight is Papa Love! So yesterday we went girly with Lovely Mums, but today we're flipping the coin. 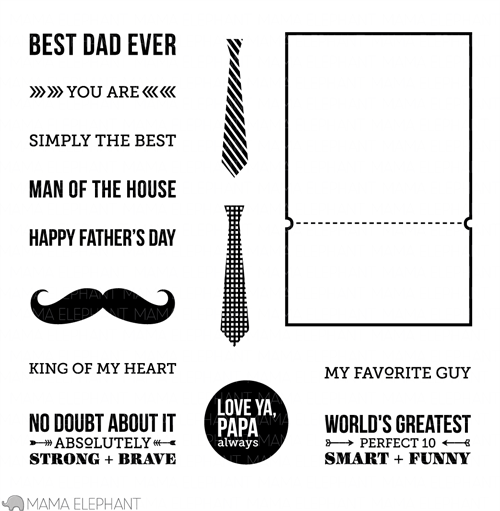 This set is named Papa Love but really it's for any guy in your life! Just look at the variety of sentiments in this one! For my card, I wanted to create something colorful but still on the masculine side. So I took the circle sentiment and turned it into a balloon. I just used a marker to draw in the balloon tail (or whatever you call that little triangle bit;) To go with the sentiment balloon, I used the balloon stamps from the Good Times set. I didn't bother masking because I really wanted that overlapping look just like real balloons. The strings are just drawn in with a silver pen. Come back tomorrow for more highlights from the March release! Have a wonderful day! 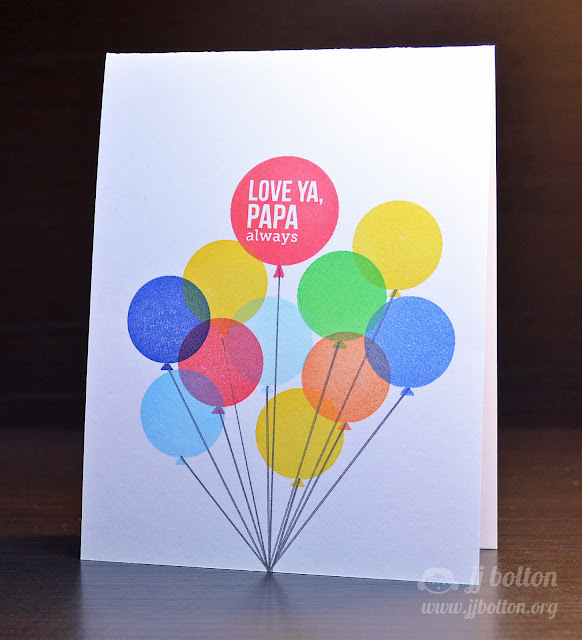 Love how you made the Papa sentiment into a balloon. I've been asked to make and donate some gender neutral birthday cards and I'll have to keep your idea in mind. Of course, I would have to go with another sentiment :). Thanks, JJ. 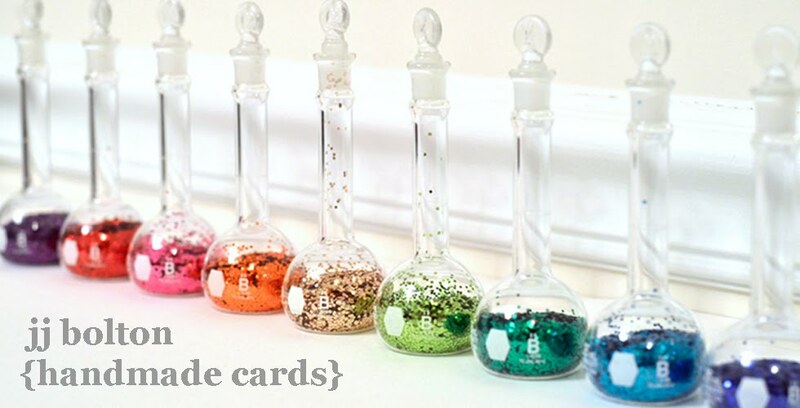 Love this card; the simplicity of the design and your color choices are a great combination! I honestly this this card is so fun!!!! LOVE the balloons and how you made te sentiment a balloon too!! Genius!! What. Perfect card!! Love the combination of CAS and a mix of bright colors! This is so cute! Love all the colorful balloons!! Great card JJ and that is such a fantastic new stamp set! Too fun JJ! I love those balloons, great colors and such a fun sentiment! SOOOOOOOOOO awesome! I LOVE that you made that circle stamp into a balloon! FUN! LOVE LOVE LOVE! ps...THANKS again! You're the BEST! That is a perfect cluster of balloons! Really like the overlapping colors, and how creative of you to turn the circle stamp to a balloon! The tails are perfectly drawn, I couldn't tell that you hand drew them. Love love love the balloons JJ! Really inspired!! OMG! How much do I love this? Super fun. Love the overlapping, love how even though there are a ton of balloons there is no confusion that the one with your sentiment is the focal point, love that it's one layer ... heck, I just love it all! Love all the overlapping colours! Such a sweet and happy card! Mama Elephant Sketch Challenge #2 in on!